As noted above, while 43% of adult cell phone users have apps on their phone, significantly fewer (29%) have actually downloaded an app. The remaining 14% only have preloaded apps on their phone. Apps downloaders are slightly different demographically from those who have only preloaded apps, and are distinct from cell phone users in general. 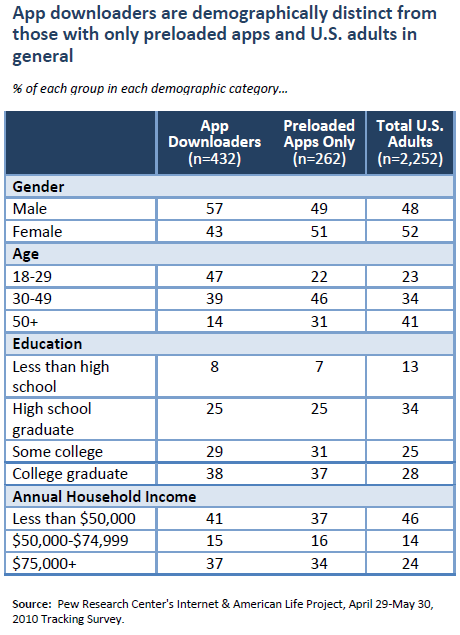 As with the apps-using population as a whole, apps downloaders are younger, more educated, and disproportionately male when compared with the full U.S. adult population. When downloaders are compared just to other adults with apps—those who have preloaded apps but do not download—they are similar in their educational attainment yet are still disproportionately young and male. In the Pew Internet survey, respondents who had downloaded apps were asked when their most recent download had occurred. 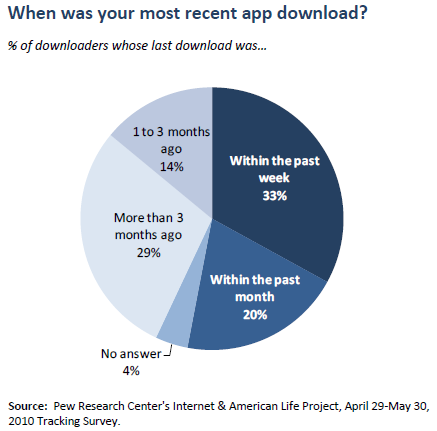 About half (53%) say their most recent apps download was in the past 30 days, including 33% who say their last download was within the past week. As a fraction of all cell phone-using adults, that equates to 15% who have downloaded an app in the past month, including 10% who have downloaded an app in the past week. Thus, even among downloaders, the portion who is very actively engaged in apps culture is relatively small. A significant percentage of downloaders, 43%, say they have not downloaded an app in more than a month. Again, it is the youngest adult cell phone users leading the way, with 62% of 18-29 year-old apps downloaders having downloaded software to their phone in the past month (including 39% in the past week). That equates to 20% of adult cell phone owners under age 30 who had downloaded an app to their phone in the past week. Among the one-third of adult cell phone users who download apps, just under half (47%) have paid for an app, with the remainder saying they only download apps that are free. Put in broader context, that means that 13% of all adult cell phone users have paid to download an app to their phone. The more apps someone has on her phone, the more likely she is to have paid for one at some point. There are very few notable demographic differences between downloaders who pay for apps and those who do not. Only one subgroup of downloaders stands out in this regard, and that is heavy cell voice users. Downloaders who make more than 30 calls on their phone per day are significantly more likely than other downloaders to have paid for an app (61% v. 45%). For more on what types of apps downloaders pay for, and how much they spend, see Part IV of this report.